If you write business letters or other company documents, there are almost certainly some terms (like your company or product name), that you end up typing a lot. This might not be an issue if your company name is “Acme, Inc.,” but something like “Serious Business Strategies” or “Life Enhancement Supplement” might get a bit tedious after the third of fourth time you type it. There’s a solution built into every modern word processor: Auto-Correct. Back in the day, auto-correct was something that non-typists fell in love with. Its purpose was to catch, and automatically correct, common typos (like “hte” for “the”) or misspellings (“acommodate” for “accommodate”). No sooner have you hit the space bar than the typo or misspelling corrects itself. Wonderful! But with a little imagination you can get a lot more mileage out of this feature than simply saving yourself from embarrassing mistakes (and not all of those, either, because it won’t fix “their” when you should have said “they’re” or “then” when it should have been “than”). You’ll find this one by looking under “Options” (from the Tools menu in Office 2003 and earlier, and in the hidden stuff under the Office logo in Office 2007). Find the Proofing tools and look for AutoCorrect. It’s all in the way the feature works. 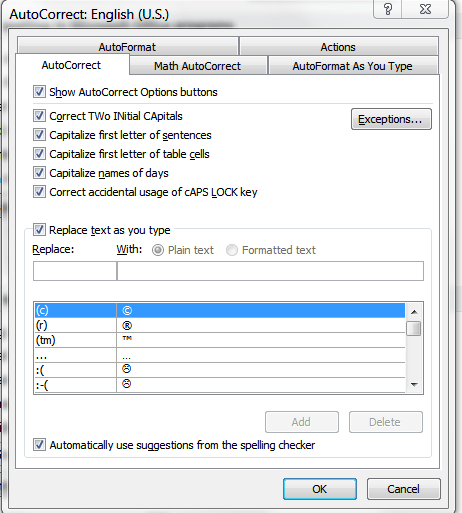 The word processor (Microsoft Office Word, for example) watches the words you type, and when it sees a “word,” like “adn” that is listed in its auto-correct list, the program immediately substitutes what the list says is the correct one. Any combination of letters in the “Replace” column can be replaced with its corresponding entry in the “With” column. If your company is “Acme Widget and Automation, Inc.” you can type “awa” in the “Replace” box and the full company name in the “with” box, then click OK. From now on, any time you need to type the company name, just type “awa.” As soon as you press the space bar, those nonsense letters turn into Acme Widget and Automation, Inc. This works for people’s names, product names, or even (as you see in the screenshot) for substituting an actual copyright symbol © for the typed (c). Best of all, you only have to get the spelling right once. After that, it will always, automatically, be correct.